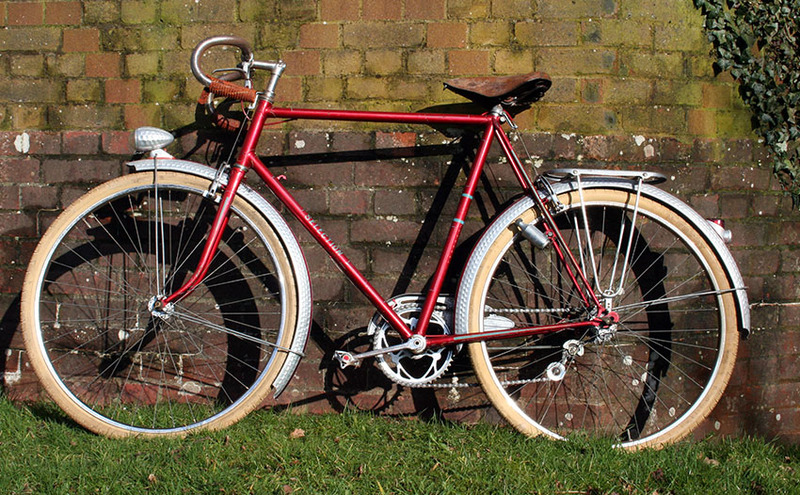 This superb French tourer is a new-old-stock bicycle. Until it was assembled just before I bought it in 2007, it had remained in its original packing box since 1952. Like the bicycle above, my two ‘Select 52’ cyclemotors, made by the same company, were also ‘new-old-stock’ from a Paris cycle shop that closed down in 1953. You can see that these early ‘mopeds’ were not far removed from bicycle design. In what was no doubt quite an innovative arrangement in its day, the Le Poulain engine operates via 3 gears on the back wheels. And there’s a spring inside the front handlebars for the front suspension!